With their smiling faces and energetic personalities, dolphins have long captured the hearts of enthusiastic zoo and aquarium guests. Children and adults everywhere become instantly exhilarated when they plan their trip to the local aquarium, absolutely thrilled at the chance to watch dolphins jump through hoops and splash tail-fulls of salty water on kids in the front row. Some aquariums even offer the totally “awesome” opportunity for guests to interact with cetaceans up close and personal through, “Trainer for a Day,” gigs or, “Swim with a Dolphin!” programs. While these programs are captivating for eager animal-lovers, the conditions that captive cetaceans live in are anything but enchanting. Ever since the 1860s, dolphins and porpoises have become star attractions in entertainment-based facilities. The first commercial dolphinarium was opened to the public in 1938, and popularity for dolphins skyrocketed in the late 1960s when the hit show Flipper graced the televisions of wide-eyed and imaginative children. As a result of the growing demand for bottlenose dolphins, cetaceans everywhere were stolen from the wild … ripped from their tight family bonds and forced to live in small, dingy tanks for the sake of amusing humans. Fortunately, documentaries such as The Cove and Blackfish have recently contributed to a shift in public opinion on captive cetaceans. These documentaries have lead to the overall decrease in mega-park SeaWorld’s profits, attendance, and overall support. While we agree with this rapid decline in SeaWorld’s empire, we have to wonder if there are other marine parks that we should start shifting our attention towards. Based on our research, we can definitely say that the Taiji Whale Museum (located in Taiji, Japan) is quite possibly one of the worst parks in the world to incarcerate wild-caught dolphins and whales. While no marine park is capable of replicating the vastly complex marine ecosystems that cetaceans call home, the living conditions at the Taiji based dolphinarium are without a doubt the worst tanks known today as they are painfully tiny and incredibly depressing. The museum also houses other cetaceans, some in outdoor enclosures that prove to be equally dismal for these dynamic beings. This museum is also notable for its clear support of the Taiji dolphin drives that support cetacean aquarium trade around the world. For these reasons, it is time that the Taiji Whale Museum is exposed for its cruel practices. 1. Where do Taiji Whale Museum’s Animals Come From? Innocent cetaceans serving a life sentence in the Whale Museum prison come from (as some of you may have already guessed) the infamous and bloodstained cove of Taiji, Japan. According to Sea Shepherd, Taiji is the “‘ground-zero’ for the international slave trade of live dolphins.” Dolphin hunters can make up to $32,000 for a single live dolphin, but a trained captive dolphin can sell for around $250,000. While dolphins captured in the infamous cove are sold to hundreds of aquariums and zeros worldwide, there is one Taiji based museum that can take dolphins straight from their backyard. Each year, Taiji hunters corral a whopping 2,000 dolphins and porpoises in a small, hidden cove where the cetaceans await one of two fates. The first destiny applies solely to the “better-looking” individuals (typically bottlenose dolphins) who marine parks and zoos select, purchase, and transport. These dolphins and porpoises live out the remainder of their lives as the subjects of entertainment for human audiences worldwide. The second option? All other corralled victims are brutally exterminated and sold as meat at the hands of Japanese fishermen. While the dolphin drives are the most famous source of the Taiji Whale Museum’s dolphin residents, the museum has also featured wild caught orca. One such orca, Nami, died was captured off the coast of Taiji and forced to perform in shows for 24 years. She died in 2012 after swallowing 180 pounds of stones from the bottom of the “natural cove” where she was kept on display. After her death, the Taiji Whale Museum dug up her remains and her skeleton is now on display in the museum. Just this past May, Dolphin Project leader Ric O’Barry teamed up with Sarah Lucas, the CEO of Australia for Dolphins, to sue the Taiji Whale Museum for animal abuse and unconstitutionally, for preventing foreign observers from entering the building. This lawsuit was prompted by the museum’s capture and exploitation of an albino bottlenose dolphin calf. Images of the slaughter surrounding the calf went viral back in January, and the general public became outraged by the brutality surrounding such an angelic looking baby (hence the name, Angel). By denying foreigners (mainly Westerners) access to the facility, museum workers believe that word of animal cruelty will not reach public media. There is very little doubt that zoos, aquariums, and dolphinariums are unable to replicate the activity that occurs daily in the open oceans. Despite this, captive facilities tend to think they can escape this fact by adding “stimulation” to the schedules of dolphins and whales in the form of shows and guest interactions. While this change in schedule is without a doubt a terrible excuse for animal care, we have to admit that the dolphins living at the Taiji Whale Museum have it far worse than their average marine park counterparts. In the wild, cetaceans roam the open oceans and are capable of swimming up to 100 miles in a single day. In the cramped, concrete and glass enclosures at the Japanese prison, dolphins reside in just a few feet of water. Tank demensions are 20 x 15 feet, and cetaceans are denied stimulation. We could talk about this painful practice all day, but the best way to inform readers is if we show you. Grab a box of tissues and watch these two pantropical spotted dolphins suffer at the hands of man. Dolphin calves will usually stay with their mothers for three to six years, but they sometimes stick around for longer periods of time. Unfortunately, juvenile dolphins are often the most sought after cetaceans when it comes to the aquarium trade. This is because they are easier to train throughout their lifetime as opposed to older individuals. For this reason, dolphin calves are often prematurely separated from their mothers. The separation of dolphin calves from their mothers is an incredibly traumatic experience that can often lead to acts of suicide by dolphin parents. This was the case for Angel who was captured in Taiji with 250 other pod mates. Angel was selected for the Taiji Whale Museum because of her rare coloration — a unique characteristic that could easily attract tourists. After being separated from her calf, Angel’s mother was documented sinking to the bottom of the cove where she was never seen again. Most cetaceans are incredibly social, and roam the oceans in the company of large pods. These pods can harbor thousands of individuals who benefit from long lasting relationships and even call each other by names. While some dolphins have been recorded hanging out with other cetaceans that are not of the same species, pods tend to consist of a single species. This is because different species of dolphins have preferences as far as what foods they like, where they like to hunt, and how they like to hunt. At the Taiji Whale Museum, several species of dolphins are thrown into the same small tanks where they are expected to coexist peacefully. While different species of animals can sometimes live in harmony, they are often subjected to bullying (and even death) if cage-mates are unable to get along. In the case of cetaceans, they are forced to submit to the tortures inflicted on them by their tank mates. 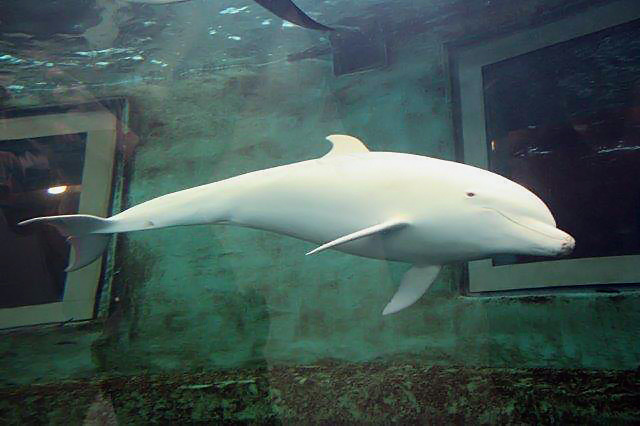 Angel the albino bottlenose dolphin, for example, is continuously bullied by two striped dolphins. Unable to put up a fight with the older males, she must swim rapidly around her small tank in the hopes of avoiding her oppressors. But the Taiji Whale Museum is in a completely different country. We can’t just pack my bags and catch a flight to Japan to boycott and protest! Besides, the museum won’t let most foreigners past their entrance, so clearly there is nothing we can do. WRONG. Don’t give up hope just yet! While there are bridges that need to be built to help animal-lovers everywhere save the cetaceans that are currently living in their fishbowl prisons, there are plenty of easy-peasy options to get you started on your path to supporting the end of the Taiji trade. As mentioned before, hunters in Taiji supply cetaceans to more than just their local dolphinarium. There are hundreds of parks that benefit from dolphin drives, so be sure to avoid parks that aid in the cruel practice. Right Tourism has provided an extensive list of facilities in multiple countries that you should probably avoid. After exploring the many abuses facing Taiji Whale Museum’s animals, I’m sure you would be shocked to hear that the popular travel company, Tripadvisor, has few negative reviews about the museum. This is because of the museum’s racist act of denying foreigners (people who have most likely been made aware of the unpopular Taiji dolphin hunt) the ability to view the horrendous living conditions of captive cetaceans. The positive reviews read on the website stem from the museum’s cheap prices when it comes to feeding and interacting with dolphins. Some locals see no evidence of wrongdoing when they enter the gates to Hell, and it is time that they realize just how horrible the Taiji Whale Museum is. Please help these trapped cetaceans by sharing this post in the review section of the Taiji Whale Museum on Tripadvisor. Leave a comment addressing the museum’s cruelty to their animals, and help us spread the word! Let us known (in the comments sections) about other animal attractions that should be banned for the way they treat animals.